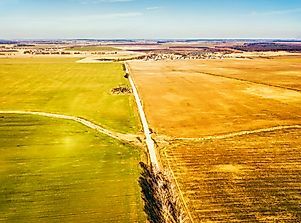 Unfortunately, many people fail to realize that the seats of Western civilization are surrounded by a unique range of habitats and biodiversity. 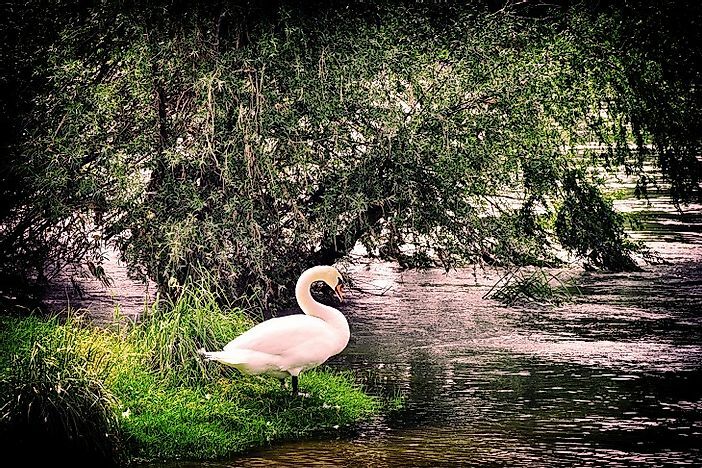 A swan stands upon the banks of the River Rhine in Germany. The Reindeer, Pine Marten, Arctic Fox, and Norwegian Lemmings of the cold North. The Saiga Antelope and Karakurt spider of the Russian steppe. The Camargue Horses and Alpine Long-Eared Bats of southern and western Europe. The Wild Boar and Raccoon Dogs of North-Central Europe. No matter where one goes in the continent that has served as the historical seat of Western Civilization, a unique set of diverse animals is sure to be found nearby. In fact, even in places where one cannot go, biodiversity may still abound, such as is the case in the radioactive Chernobyl Exclusion Zone near the border between Belarus and the Ukraine. In respect for these animals and their ecological importance, many countries have set aside significant amounts of land to protect their habitats. In fact, several European countries feature among the countries with the largest proportions of their areas set aside as protected lands. Below, we take a look at but ten of the countless, unique, and iconic animals to be found on the European continent. The wild boar is omnivorous. and in the same family as the domestic pig. It has a pig-like snout, and its canines are visible even when the mouth is closed. The wild boar’s length from head to rump is 153 to 240 centimeters, and weighs from 66 to 272 kilograms. Its height is up to 90 centimeters at the shoulders when mature, according to Animal Diversity (AD), though females are significantly smaller than males. An adult wild boar has a thick, coarse hair coat that’s black to brownish-red to white. During birth, a young wild bear has yellowish-brown stripes on its back, and this fades to an even, singular color after 4 months. Primarily, the Wild boar feeds on fruits, seeds, roots, and tubers, but also scavenges for meat. Wild boars are nocturnal, and live in groups of 6 to 20 called "sounders", according to ARKive Initiative. 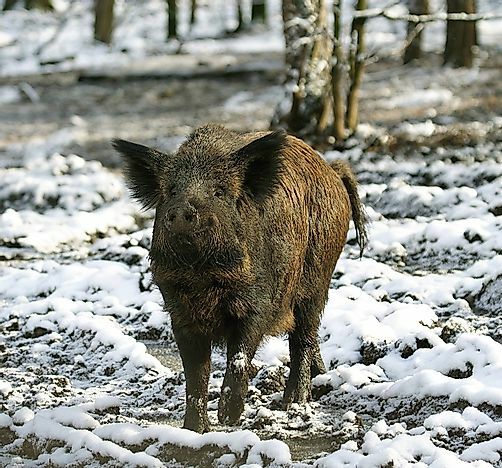 A wild boar can live in any climate except in extremely cold or extremely hot habitats. It’s native to Europe and Asia, and there it lives in such varied habitats as the grassy savanna, wooded forests, shrub lands, and marshes. A female wild boar achieves sexual maturity at 8 to 15 months, and males at 7 to 10 months, and the maximum it lives is 9 to 10 years in the wild, according to Animal Diversity. 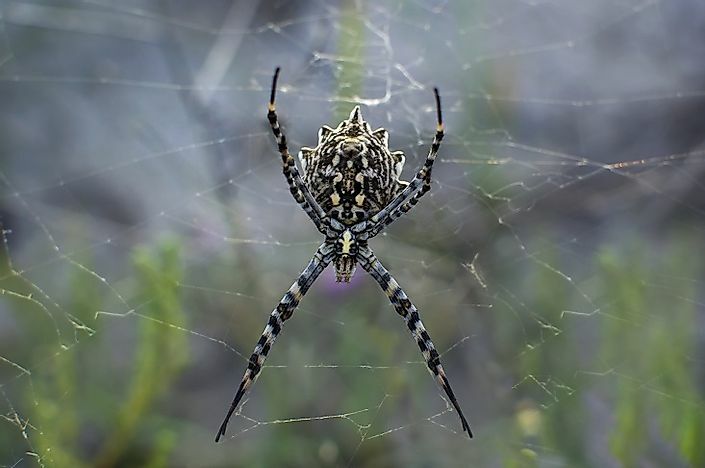 The Karakurt spider, also called the Mediterranean black window, is found in the south of France, Corsica and other Mediterranean territories, Russia’s Astrakhan region, and Kazakhstan. It’s venomous, and its bite on a human may result in convulsions, low body temperature, muscle spasms, nausea, breathing difficulties, and vomiting. The Karakurt spider has a shiny black body, and juveniles and adult male species have 13 spots on their backs. For males, the spots are creamy white, while young females have red, and at times yellow to orange, marks, though adult females are generally black in color. The female size is 10 to 15 millimeters, while males are smaller, in fact less than half the size of the females. Its habitat is the grassy areas in hot, dry places like coastal dunes, but they also build webs in abandoned rodent holes, as well as underneath rocks and logs. Male Karakurts stop eating before mating, and after mating it dies, thereby perpetuating the black window myth that it’s the female that kills the male. In Kazakhstan, camels bitten by the Karakurt spider have died. The Karakurt spider is most active on summer nights. Discovered in 2003 in the Austrian Alps, the Alpine or mountain long-eared bat ( Plecotus macrobullaris) is 4.5 to 4.8 centimeters long. It has big and developed ears, and lives at an altitude of 1,800 meters or above, according to Limno Pirineus. 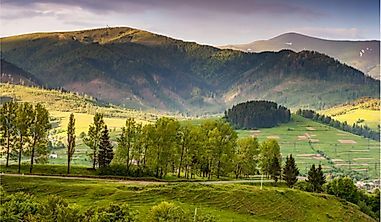 The Alpine long-eared bat's range includes the Pyrenees ( Andorra, Spain and France), the Alps from France to Slovenia, the Dinaric Alps, Crete, Greece, Corsica, Anatolia ( Turkey, and, in Asia, southern Iran and Syria, according to the International Union for the Conservation of Nature (IUCN). In those ranges, the Alpine long-eared bat hides in rocks, crevices, and ledges, and lives in colonies of up to 50 bats. 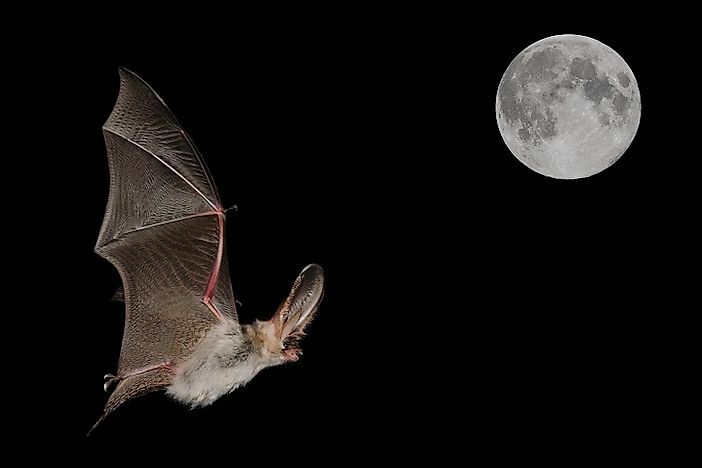 Research on this bat species is still ongoing, but 97.8 percent of its diet has been found to consist of moths, according to a study published on the Public Library of Science. The Norwegian lemming is a mouse-like rodent endemic to Norway, western and northern Sweden, northern Finland, and the Kola Peninsula of Russia, according to the International Union for the Conservation of Nature. It weighs from 20 to 130 grams, and the length ranges from 8 to 17.5 centimeters, according to Animal Diversity. Norwegian lemmings' fur colors are black and brown, with golden yellow strips. Its underbelly is lighter than the rest of the fur. Tundra and alpine regions, a variety of bogs, marshes, and moist terrestrial habitats serve as the Norwegian Lemmings' habitats. It also lives in heath lands with dwarf shrubs as the main vegetation. The Norwegian Lemming is active in both the day and night, and it forages about for grasses, lichens, stems, grains, and bark. 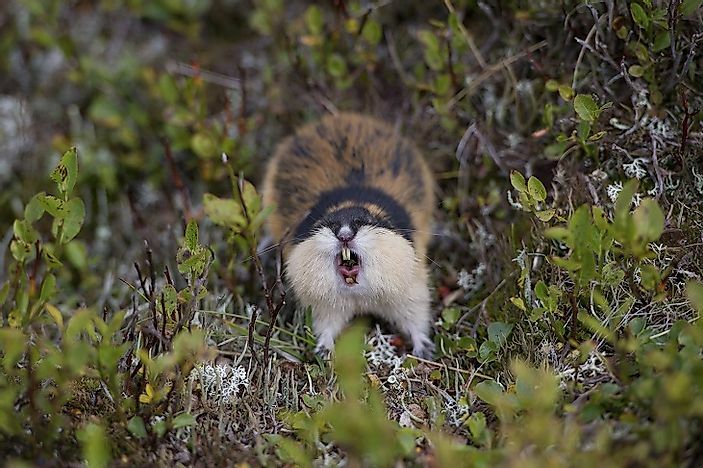 Norwegian Lemmings live independently of each other, and if there is overcrowding they fight amongst themselves. On average, sexual maturity for females is achieved at 3 weeks, and the same occurs at on month for males. The lifespan of the Norwegian Lemming is 1 to 2 years in the wild and, on average, 3.3 years in captivity. 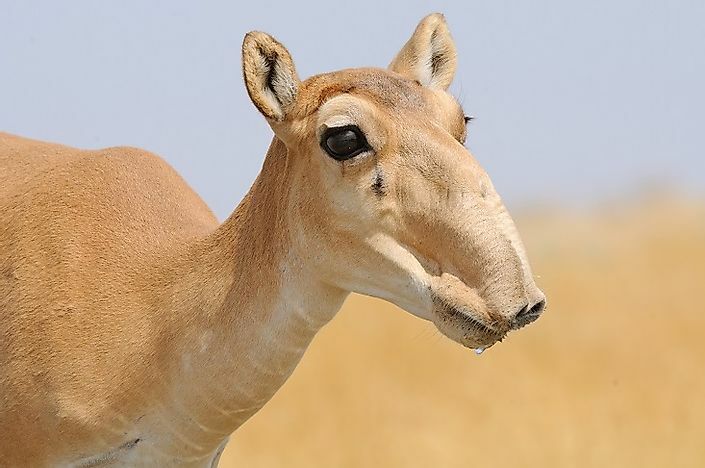 The Saiga antelope stands out for its large, proboscis-like nose. Its head and body length is 100 to 140 centimeters, and its shoulder height is 60 to 80 centimeters, with a tail that is 6 to 12 centimeters long. The Saiga antelope’s weight is between 26 and 69 kilograms, according to the Zoological Society of London. Its woolly body fur coating is brown to light brown, and it has an underbelly with white patches, and ridged, amber-colored horns. Populations of the Saiga are spread out across Russia, Uzbekistan, Turkmenistan, Kazakhstan, and Western Mongolia. 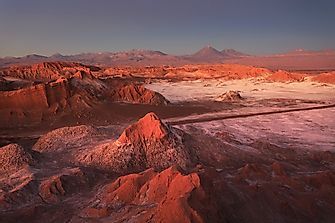 In these countries, they live in open dry steppe grasslands and semi-arid desert habitats. These flat open areas have low growing vegetation that enables the Saiga to detect and evade predators. These areas also have grasses, steppe lichens, herbs, and shrubs the saiga feeds on. Saiga antelopes are social, and live in herds of 30 to 40 animals and, when migrating, they move in groups of thousands. According to Animal Diversity, female Saigas achieve sexual maturity at 7 to 8 months, and males at 2 years. Their lifespan, according to the World Wide Fund for Nature (WWF) is between 6 and 10 years. The Saiga is a critically endangered species, according to the International Union for the Conservation of Nature, and only 50,000 of them remain. 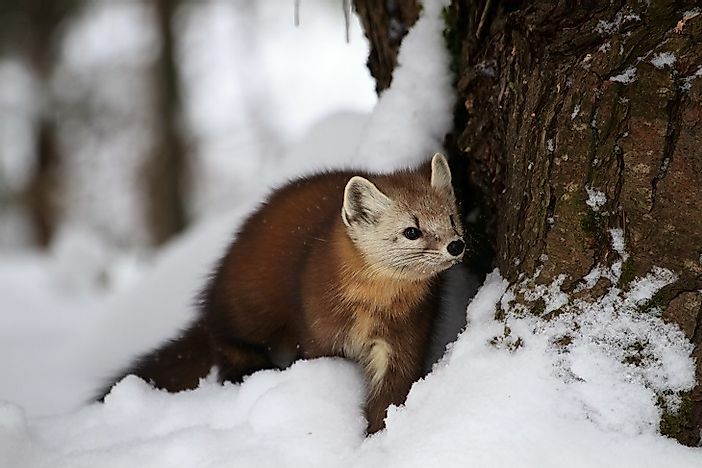 The pine marten is an omnivore the size of a cat, and a member of the Mustilidae family that also includes badgers, weasels, stoats, and polecats. It has dark brown fur, light orange or creamy throat patches, and a long, fluffy tail, according to The Mammal Society (TMS). A male pine marten’s length is 51 to 54 centimeters, and that of a female 46 to 54 centimeters. The male’s tail length is 26 to 27 centimeters, and for female the tail is 18 to 24 centimeters. A male pine marten weighs 1.5 to 2.2 kilograms, and a female 0.9 to 1.5 kilograms, according to The Mammal Society. Large populations of the Pine Marten are spread about the Scottish Highlands, the Grampian Mountains, and Ireland, with smaller populations in Southern Scotland. Their ideal habitat is wooded areas with abundant cover, including coniferous, deciduous, and mixed woodlands. In these ecosystems, the pine marten feeds on birds, beetles, small rodents, carrion, eggs, and fungi. Then, in autumn, it shows a proclivity for devouring berries. Pine Martens are social, and live in associations in hollow trees and dens. They mark their territories with feces on their forest trails, and are most active at night or dusk. In the wild, according to Animal Diversity, they achieve sexual maturity at 14 months, while in captivity males begin to mate at 27 months. In the wild, they can live from 8 to 10 years, according to various studies. A raccoon dog has dense, soft, fur that is black or grayish-brown with specks of white and cream. It has a dark, dog-like muzzle surrounded by white fur and whiskers. The small eyes are surrounded by grey fur, and its forehead has a blend of gray and white fur and rounded ears. The raccoon dog’s legs are short with dark gray fur, and the underbelly is largely gray with white specks of fur. Its body’s fur ranges from grayish-white to light brown, as well as that of its bushy tail. The raccoon dog’s height is 38.1 to 50.8 centimeters, and the tail length is 13 to 25 centimeters. It weighs 4 to 6 kilograms in the summer, and before hibernation in the winter, it increases its weight to from 6 to 10 kilograms. Native to East Asian countries and eastern Siberia, the introduced raccoon dog is now widespread across Northern, Eastern, and Western Europe, having been introduced there from between 1927 and 1957. Today it’s in Finland, Sweden, Norway, Poland, Romania, Czech Republic, Slovakia, Germany, France, Austria, and Hungary. 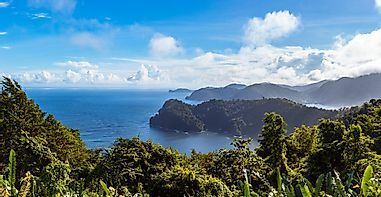 In these countries, it lives inc anything from subarctic to subtropical climates in places near water sources, especially those with forests and dense vegetation like thick underbrush, marshes, and reed beds. 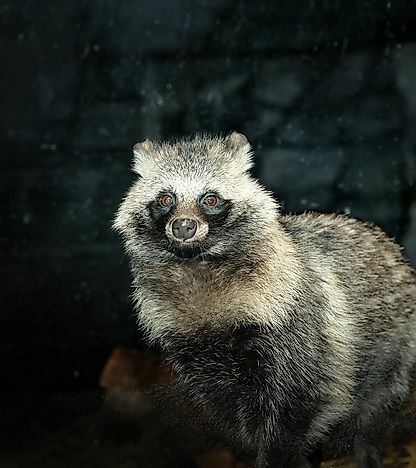 In these habitats, the omnivorous raccoon dog feeds on birds, fish eggs, carrion, insects, aquatic crustaceans, and mollusks, as well as leaves, roots, tubers, wood, bark, stems, seeds, grains, nuts, and fruits. It achieves sexual maturity at 9 to 11 months. In the wild, the average lifespan of a raccoon dog is 2 to 5 years, but in captivity it can live up to 16 years. Raccoon dogs live in small groups and hunt and hibernate in pairs, and are also conscious about grooming, according to Animal Diversity. The Reindeer is a herbivore native to Greenland, Finland, Mongolia, Norway, Russian Federation, and the Jan Mayen and Svalbard islands, according to the International Union for the Conservation of Nature. Instead of horns, male and female reindeers have branch-like antlers on their heads. The length of a male reindeer from head to rump is 1.8 to 2.14 meters, and weighs 92 to 210 pounds. A female’s length is 1.62 to 2.05 meters, and weighs 170 to 260 pounds. The height to the shoulder for both male and female ranges from 0.85 to 1.5 meters, and the tail is 14 to 20 centimeters long, according to the World Animal Foundation. A large part of a reindeer’s diet in the summer is comprised by grass and plants like sedges, birches, and willows. Then, during wintertime, it predominately consumes lichens, reindeer moss, and mushrooms. These food sources are found in boreal forests, the Arctic tundra habitats, and mountain ranges. 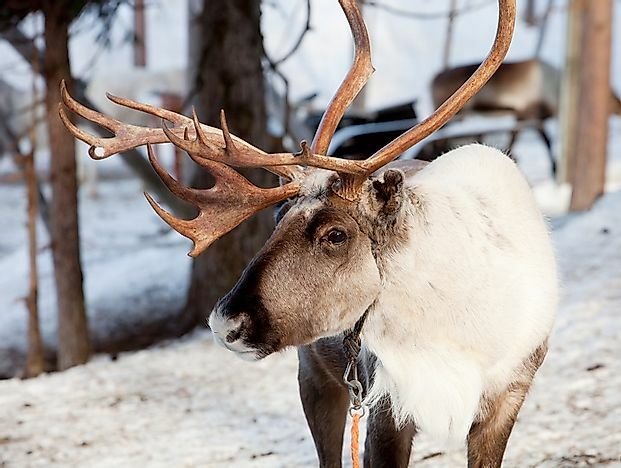 Reindeers live in herds ranging in size from tens to hundreds, whether as residents or migrating, according to One Kind. In a single day, they can walk 19 to 55 kilometers, and can run at speeds of 60 to 80 kilometers per hour. Reindeers achieve sexual maturity at 1 to 3 years, and have an average lifespan of 15 years in the wild, according to National Geographic (NG). 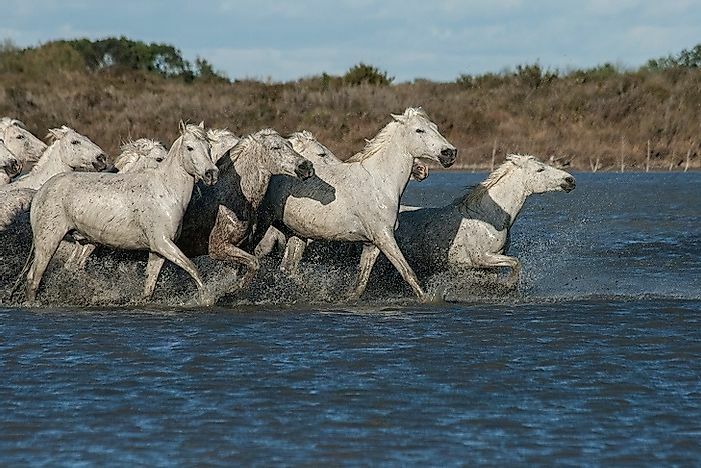 The Camargue horse's origins are traced to the harsh wetlands of the Camargue region in southeastern France, where historically they have been used as work and draft animals since the 8th Century. It has a pale gray to white-orange coat when mature. The Camargue horse’s height is 1.35 to 1.45 meters to the shoulders, and weighs 300 to 400 kilograms, according to a study by the Oklahoma State University's Department of Animal Science. 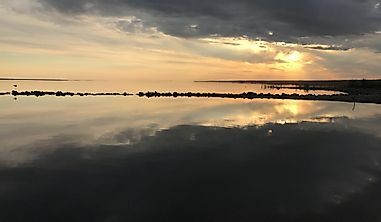 Its ideal habitat is the watery plains and salt marshes in southeastern France. This region is seasonally cold during the winter and hot in the summer, but the Camargue horse is adapted to the extreme climate conditions. Primarily, it feeds on grasses and herbs, including an indigenous plant called the samphire, as well as the tender shoots of tall reeds, according to Lady Wildlife. When food sources are scarce, it grazes for up to 22 hours daily, but when it’s in plenty only from dawn and dusk. The Camargue horse is social, and lives in free ranging herds, and produces a piercing or whiny cry. A female horse achieves sexual maturity at 18 months, and the male from 1 to 2 years. A Camargue horse has an average lifespan of 20 to 25 years. The Arctic fox lives in snow burrows in temperatures as low as minus 50 degrees centigrade in the treeless tundra of the Arctic regions. This extends into Eurasia, North America, the Canadian archipelago, the Siberian islands, Alaska, Greenland, Iceland, and Svalbard Island. The Arctic fox’s length from head to rump is 0.76 to 1.1 meters, it has a 12 inch tail, and the height at the shoulders is 9 to 12 inches according to Defenders of Wildlife (DOW). The Arctic Fox weighs 6.5 to 21 pounds, though the female fox is significantly smaller. Its main diet comprises of rodents like lemming, fish, and birds, but it will also scavenge for carrion. 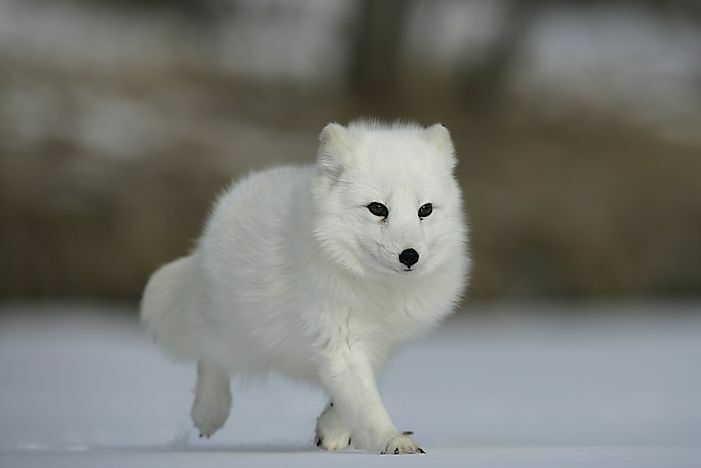 The Arctic fox has thick fur that in winter changes to white or blue-gray to blend in with the snow, and after winter changes back to brown or gray to blend in with the tundra’s rocks and plants. The fur enables it to maintain steady body temperature as well, and its thick paws allow it to walk on snow and ice. The Arctic fox has strong hearing thanks to its wide, frontward-facing ears which enable it to locate prey even beneath the snow. 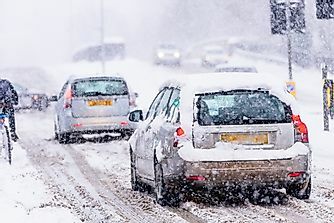 On hearing the prey’s location, it leaps into the air and breaks through the snow layers and grabs the prey hiding beneath, according to Defenders of Wildlife. The Arctic fox achieves sexual maturity at 9 to 10 months, and has an average lifespan of 3 to 6 years in the wild. Arctic foxes lead a communal nomadic life in small clusters called "skulks" or "leashes".